Informative, beautiful and relatable, it's hard to find somebody who doesn't find antiquarian maps interesting, but just in case you're not convinced, here's a list of some of our favourite map-facts. The earliest known maps depict the heavens rather than the earth. Dots have been found in caves as early as 16,500 BC which map out the constellations and parts of the night sky. It is a much perpetuated myth that Christopher Columbus was the first to discover that the earth was round, in fact, the earth as a sphere was widely accepted by the Ancient Greeks as early as c. 200BC, when the scholar Eratosthenes became the first person to calculate the circumference of the earth by measuring the length of shadows cast by the sun. Surveying in order to make a map is a laborious process, even more so considering the technology available several hundred years ago – perhaps that's why some mapmakers chose to skip the process entirely by copying the maps of others. 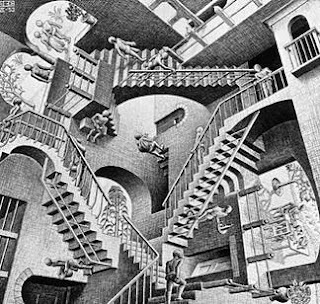 Some cartographers included deliberate mistakes in order to catch out potential forgers, others simply got it wrong. 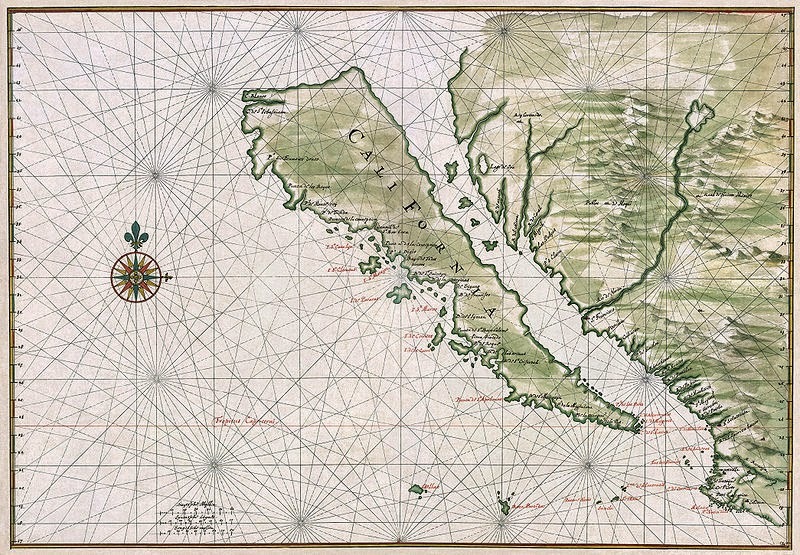 The most famous of these mistakes is the depiction of California as an island, an error that first appeared in the 16th century and, despite being fairly quickly disproved, continued to pop up on various maps for the next two centuries. In 2001 the Library of Congress paid a whopping $10 million for the Waldseemüller map, the first map to describe the New World as 'America'. America was so-named after Amerigo Vespucci, the man who first discovered that Brazil and the West Indies were part of a separate super-continent, and not Eastern Asia as previously assumed. Francis Drake was the first Englishman to successfully circumnavigate the globe as well as the first captain to return with his ship. He set off in 1577 and returned three years later with enough booty to pay off the national debt (much to Queen Elizabeth's delight) and more than a few stories to tell. However, Drake was not given the opportunity to boast about his discoveries, as the Queen insisted that his route and plunderous activities stay secret from the Spanish. All written accounts of the journey became Secrets of the Realm and his route was not permitted to appear on the maps of the day. When his route was finally described on a map, it appeared on a silver medallion. 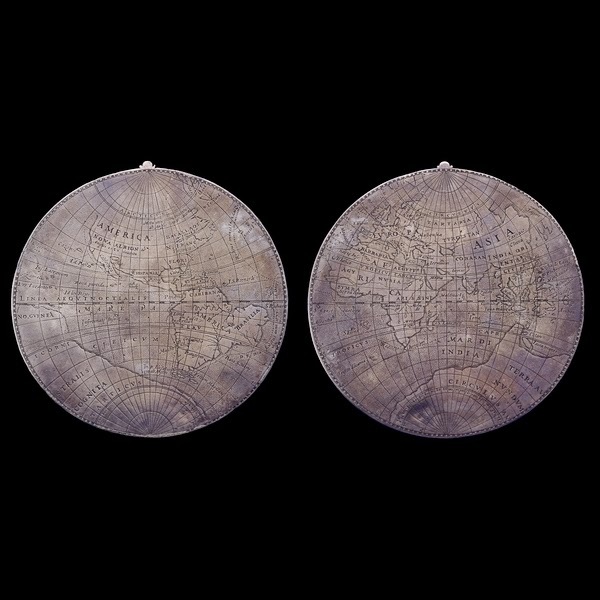 Only nine known copies of the silver map are known, one of which is in the British Museum. Up until the late 19th century, when significant advances in colour printing were made, the majority of maps were printed solely in black and white. Colour was frequently added by hand at the time, either to enhance the beauty of the map or to make it easier to use by highlighting specific areas. Although there were professional colourists who worked on certain maps to a very high standard, the majority were coloured in production-line fashion, frequently by children. As a result much 'contemporary' colour is a little messy! To make matters easier for the colourist some mapmakers had certain areas (such as armorials) engraved in accordance with a special key or code. Latin initials or a system of dots, lines, and cross-hatching would indicate which colours went where. In 1854, just around the corner from Sotheran's in Soho, London faced one of the worst cholera epidemics to have occurred in Britian. 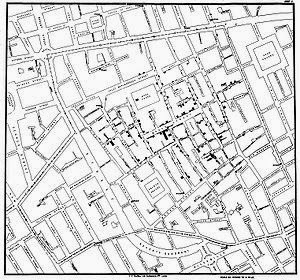 The cause of such diseases at the time was generally considered to be polluted air, but by talking to local residents, and mapping the pattern of fatalities, the physician, John Snow managed to trace the source to an infected water pump in Broad Street (now Broadwick Street). He later published his findings on his famous spot map of the area. These days travelling from A-Z is a luxury that many of us take for granted. Even the simple act of map reading is fast becoming left to an electronic device; just key in the post code and the work is done for us. If the thought of pulling up at the side of the road and retrieving the map from the glove compartment now seems a pain, imagine the plight of our ancestors! What can now be achieved in a matter of hours would have taken days or even weeks on horseback (and they would have had to read the maps themselves). 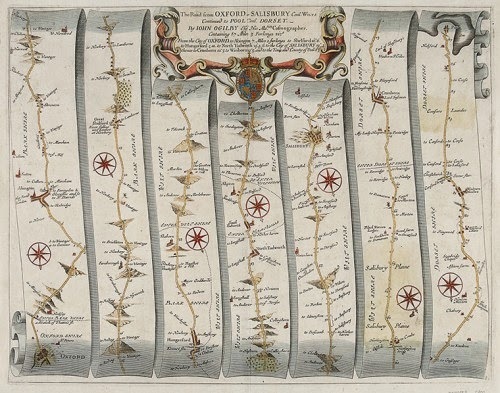 To complicate the matter even further different counties used different lengths of mile, a problem John Ogilby endeavoured to rectify, when, in 1675, he published his Britannia, the first ever atlas of British road maps and the first work to introduce the universal use of the statute mile. 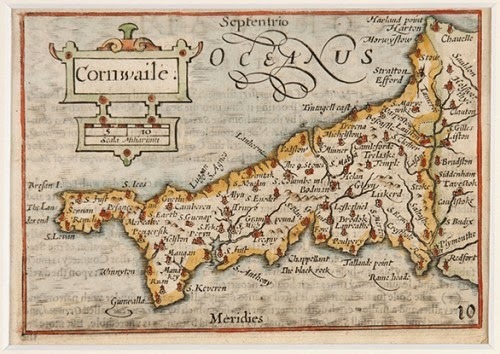 VAN DEN KEERE, Pieter.Cornwaile [Cornwall]. Although with certain important maps the sky is the limit in terms of price it is still entirely possible to begin collecting antiquarian maps on a modest budget. Whilst many people have heard of John Speed (arguably the most famous of all the British cartographers) lesser-known are the works of PieterVan den Keere, who engraved wonderful miniature versions of Speed's county maps. As they were so popular in their time, many editions of the pocket atlas were printed, meaning that today it is possible to own an authentic 17th century map for less than £100. To view a selection of antiquarian maps on our website please click here, or follow our Pinterest board for new stock updates.